What was the inspiration behind the series of paintings currently exhibited at the gallery? The subjects I choose are really just objects I think would look good in a painting. Some of them are objects which I had from my childhood, others were things I picked up on EBay – so it doesn’t necessarily have to have an autobiographical content. If I think it looks good on a painting then I’ll have it in the studio and eventually paint it. All these still life paintings feature a remarkable attention to details, which display your impressive technical ability. Is this a kind of approach you also adopt in your everyday life? Yes I’m a creature of routine. Generally I like to know where everything is and I don’t really like things to be messy. My studio is an ideal space for the objects being painted. How long does it usually take to complete a painting, from the moment you have a general idea of how the picture is going to look like until the finished result? Could you walk us through this process? It depends – the Potatoes were really only finished in the spring of this year and I started them in 2013 so it took me a year and half. But I was struggling with them because of the background so I would leave it and wouldn’t touch it for a month and then come back to it. The Bread instead took me two or three months, it just went right. I would spend maybe two or three days painting the natural object and then just leave it for a week; then I’d paint a layer on the background, leave it again for a week and after that I would get an idea whether it is right or wrong, if it’s the right tone or the right colour. It’s a very subtle shift of colour between the background and the foreground so I just make tiny little adjustments to it. I really spend just only a few days painting the actual object and then I use it as a reference. So you first paint the object and then the background. Yes. Because the background’s blank, really. I work on multiple paintings simultaneously and I’m perfecting the works until a couple of days before bringing them to the framer’s. They are constantly on the wall so I can keep going with them – I always find something else to make it slightly more perfect. Do you enjoy more painting still life or portraits? They’re different processes. The portraits are slightly more loosely painted. Still life doesn’t move, but people… Self-portraits are grand because I can always turn around, move the mirror, shift my expression how I want it to be and there’s nobody else you’re working with. It’s the same feeling really, between still life and portraits, just slightly different processes. For the first few days I become really absorbed and then it starts to evolve and I think I’ve done well. Then after a few days I start looking at it in a different way, sometimes getting annoyed with the painting and then I start working to perfect it. Because you are working with a person and they have expectations, I feel the pressure a lot more. I want the painting to be something that they like, but I have to try and ignore that impulse in order to get a good painting. 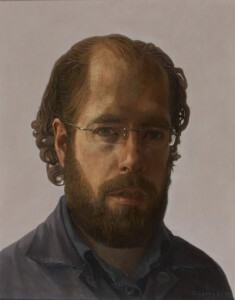 This year you’ve been selected again for the BP Portrait Award. Looking through the self-portraits you’ve made through the years, do you notice any changes in the way you see yourself? Yes. Looking at the older ones I made in my early twenties the likeness wouldn’t have been as close as now. Back then I could see a lot of distortions in the way I painted the face but in the past ten years I’ve been able to get the drawing right, with all the features roughly in the right place before actually starting painting. I don’t deliberately say I paint in a different style, the way it comes out it comes out. Which was the artwork you enjoyed painting the most during your career? When I did a big painting of my bicycle in 2008. The still lives I do are all slightly smaller than the life size objects so the size of the painting is dictated by the size of the object. The bicycle was the biggest painting I’ve done – 130 x 180 cm – so for me it was quite big. That was really nice to paint. I drew it all first and I just worked one bit at a time – the saddle, the downpipe, the chain – and it all kind of developed itself nearly. I tend to work segmentally and you could see it eventually emerging. 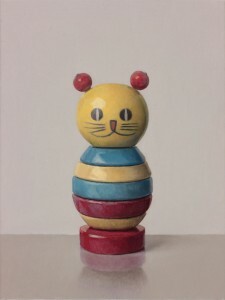 ‘An Post’ is now issuing an edition of stamps featuring images of two of your toy paintings for a limited period of time. Could you tell us how did this collaboration come about? I just got an email saying they would like to use my images. Europa Stamps are stamps used all across Europe and each country in Europe does a stamp edition on a common theme and this year it was ‘Old Toys’. Mick O’Dea, he’s a quite established Irish artist on the stamp committee and he knows my work, so he suggested these were good images to use. What piece of advice would you give to a young graduate from art school? After art school I was working and painting, then an art gallery in Belfast started buying my artworks so I worked full-time at painting them for the ten years that they were buying them from me – that’s very unusual. It gave me security for the first ten years or so but it’s very hard, I don’t think I could advise any art student because the path I followed was so unusual. Most people seems to do teaching and paint part-time as well – while others don’t, like the young artist who’d just finished A Levels and was selected for the BP Portrait award and he hasn’t even started college! It’s very competitive but shows like the BP or the Royal Ulster Academy, which is the Belfast version of the Royal Academy Summer Show – they have an annual exhibition so if you enter those shows people see the work, it’s a start, it’s all part of building up. You were also collaborating with Sky Arts. Yes, they were doing a portrait competition and I did it. It was good fun and good publicity. Actually a few people from the BP recognized me from the Sky Arts competition so it gave me an extra recognition, and all adds up.